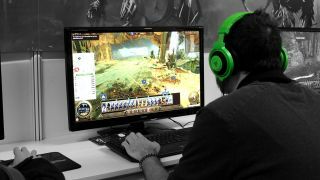 Steam stats show gamers are abandoning Windows 10 – but is that really the case? Windows 10 lost almost 40% of its users in just one month? Valve’s latest Steam survey paints a hugely worrying picture for Windows 10 on the face of it, with a massive drop in use of the OS, but Microsoft shouldn’t be engaging fret-factor-10 just yet – because there seems to be another story lurking in the background here. So, the headline figure for this month’s Steam stats is that Windows 10 has tumbled from 45.98% to 28.6%, a massive drop of 17.38% in the amount of gamers using Microsoft’s newest OS. Windows 7, meanwhile, has gained a huge 21.47% having climbed to 65.46%. This is such a massive seesaw movement in OS adoption that you’d be forgiven for thinking that Valve has made a mistake putting these figures together, somehow. However, a quick glance over the other various hardware and software categories Valve monitors shows another telling major shift – in the language being used. Simplified Chinese is up a massive 26.83%, now consisting of more than half the user base at 56.37%, with English dropping down 13.4% to rest at 21.24%. There is a good chance, in our opinion, that this is reflected in the precipitous drop of the popularity of Windows 10. So, why are there so many new Chinese gamers on Steam now? If we were to speculate, this could be due to the success of PUBG (PlayerUnknown's Battlegrounds), which is very popular in the country (with a rapidly increasing player base this year on Steam) despite potentially facing a total ban by Chinese authorities. And we’d further guess that there are a lot more Chinese gamers who have stayed on Windows 7 rather than upgrading to Windows 10, compared to the West. (Particularly given all the controversy around Windows 10 telemetry and privacy issues). In other words, this is a geographical reflection of operating system adoption, as opposed to a reaction against Windows 10 per se. That said, we certainly can’t rule out the possibility that unhappy gamers downgrading from Windows 10 to Windows 7 isn’t part of the picture, making up at least some of this huge drop in the new operating system’s user base. MS Power User spotted these Steam figures, and speculated that bugs causing frame rate hitches which have crept into Windows 10 this year could be part of the reason for what’s happened here. But it seems highly unlikely this would spark such a sudden mass revolt among the Steam gaming community, to say the least – particularly seeing as these problems have been present since the spring (and the previous Creators Update).